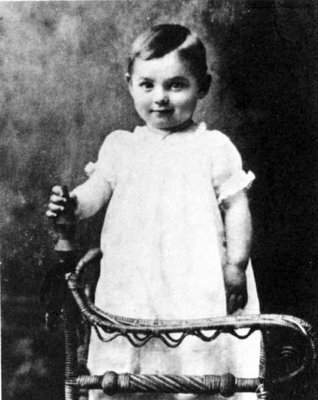 William Clark Gable was born in Cadiz, Ohio in 1901. He was named after his father William Gable, but would be called Clark. His mother Adeline had always been a sickly woman and was advised by doctors not to have a child. She passed away ten months after Clark’s birth. His father, an oil-well driller, left town in search for work and left Clark with his deceased wife’s family. When Clark was about seven years old, his father returned with a new wife: Jennie Dunlap. It was she who encouraged his interest in arts. She taught him how to sing and play the piano and he adored her. His father on the other hand, was a stern and tough man. He and Clark would never have a good relationship. Clark was known as a shy, nice and extremely tall boy, but he did not have big dreams of becoming a star just yet. When he was fifteen, the family moved to Ravena and Clark had trouble settling in. He decided to go out on his own and moved to Akron where he got a job at a tire factory. There he got his first taste of cinema and theatre and he was hooked. In 1919 Jennie Dunlap was terminally ill and Clark rushed to her side. Jennie passed away and his father convinced Clark to work alongside him on the oilfields. But it only worsened their already troubled relationship and when he received an inheritance at the age of 21, he left his father’s side for good. He drifted from town to town, before he finally settled in Portland and joined a theater company. In 1923 he started taking acting lessons with Josephine Dillon, who was seventeen years his senior. She wanted to make Clark Gable a star and became his manager. They moved to Hollywood and got married. It is believed to have been a marriage of convenience and Clark later said that the marriage was never consummated. He started getting bit parts in films, the most famous one being Ben Hur. But he got bigger parts in stage productions, such as Romeo and Juliet. In 1929 Josephine filed for divorce, citing desertion. Meanwhile Clark was dating wealthy socialite Ria Langham, also seventeen years his senior, and in 1930 they got married. He made such an impression with his performance in the play The Last Mile, that he got a top impresario who arranged a contract for him at MGM. He played in movie after movie, mostly supporting parts. But soon enough he got bigger roles and a ‘he-man’ image was created for him by the publicity department, partly based on his real persona and partly fabricated. 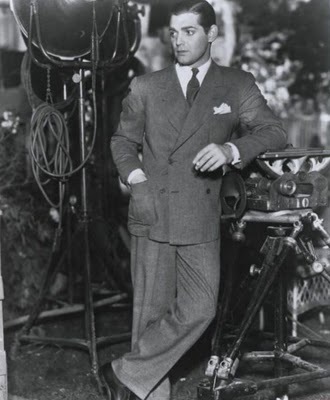 MGM teamed him up with popular leading ladies: in 1931 he worked with Greta Garbo in Susan Lenox (Her Fall and Rise) and with Joan Crawford in Possessed and Dance, Fools, Dance. Clark and Joan proved to be a very successful pairing and they would make many movies together, as well as reportedly having an affair. But the pairing that helped Clark achieve superstar status, was the one with Jean Harlow. In 1932 they made Red Dust together and they became fast friends. They would make four more films together. In 1932 MGM loaned Clark to Columbia to make It Happened One Night, which became a surprise success and made him even more popular with the public. In 1934 Clark started filming Call of the Wild. 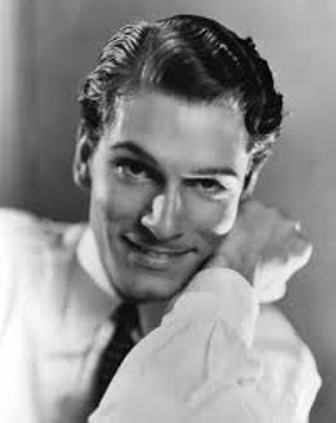 One of his co-stars was the 22 year old Loretta Young. We now know that Gable and Loretta had an affair and that she became pregnant. Since the public would have never accepted this, the pregnancy was covered up. Their daughter was put in an orphanage and when she was almost two, Loretta ‘adopted’ her. Clark never had any sort of relationship with her and she would not know that he was her father until she was twenty-three. Meanwhile, Clark’s star was still on the rise, with him winning an Oscar for It Happened One Night. His marriage to Ria was unraveling and he started dating fellow actress Carole Lombard. But tragedy struck when, in 1934, he was filming Saratoga with his good friend Jean Harlow. On the 29th of May Jean got sick on set and on the 7th of June she passed away in the hospital on account of kidney failure. She was only 26. Her funeral was Carole and Clark’s first public outing. The public loved Clark and Carole as a couple, but Clark was still married and therefore many felt that the couple was ‘living in sin’. When letters of complaint started pouring in, his studio arranged a divorce and in 1939 Clark and Carole got married. 1939 was a good year for Clark anyway, since his most popular feature, Gone With The Wind was filmed and released that year. He was the immediate favorite for the part of Rhett, but it took a nationwide search to find his Scarlett. Even though Carole, and many other actresses, really wanted the part, it eventually went to the little known British actress Vivien Leigh. The film proved to be a phenomenal success and is considered a classic to this day. Clark and Carole were a great couple by all accounts. They had the same sense of humour and Clark loved that Carole was a lady as well as ‘one of the boys’. They purchased a ranch and happily settled down. But in 1941 Pearl Harbor was attacked by Japan, which brought America into World War II. The patriotic Carole went on a tour to sell war bonds and made over two million dollars, a record at the time. At the end of the tour, which was done by train, Carole was anxious to go home. On January 16, 1942 Carole, her mother Bess and Clark’s friend and press agent Otto Winkler boarded a plane to Los Angeles along with 15 servicemen. The plane crashed into Table Rock Mountain and all 22 passengers were killed instantly. Clark was devastated. He finished the film he was working on, Somewhere I’ll Find You, and retreated to his and Carole’s ranch, where he left everything exactly the way it was when she left. In August of that year Clark joined the U.S army. Carole had suggested it before she died, but his studio MGM had refused to let him go. This time they could not stop him. Some felt that he became reckless out of grief, but Clark did not care. After training Clark went to England and flew five combat missions as an observer gunner. In may 1944 he was promoted to major. In 1945 Gable got back to work. Adventure, his first post-war film, was not very popular. But he made up for it with Hucksters, his first pairing with Ava Gardner. Clark started dating Lady Sylvia Ashley, the widow of Douglas Fairbanks, and surprised everyone when he married her in 1949. But the socialite was not a good match for Clark and they divorced three years later. A single man again, he started hitting the town with friends, drinking and ‘chasing skirt’. In 1953 he started working on another big film with Ava Gardner: Mogambo. The film was a remake of Red Dust and also co-starred newcomer Grace Kelly. But Clark had always had problems with his salary at MGM and thought that a lot of the films they chose for him were mediocre at best. So in 1953 he left MGM for good and decided to become a freelancer. By then Mogambo was released and became a huge success. Offers poured in and he decided to take an offer from 20th Century Fox for two films: Soldier of Fortune and The Tall Men. His love life was moving forward as well: he fell in love with Kay Williams. The 38-year old former model had already dated Clark a couple of years earlier, but it never became anything serious until 1954. Kay was divorced with two children and by all accounts Clark was a great stepfather. He married Kay in 1955. A few months after the wedding he formed his own production company with actress Jane Russell and her husband. They only made one film, The King and Four Queens, which was a flop and the company dissolved. After his next flop, Band Of Angels, he ran into another successful pairing, this time with Doris Day. Their film Teacher’s Pet was a big success and more comedies followed for Clark. He made a family vacation of the shooting of It Happened in Naples, bringing his wife and stepchildren and even arranging a surprise birthday party for his co-star Sophia Loren. He was very happy with his marriage and would be even happier when a couple of months later Kay announced that she was pregnant. 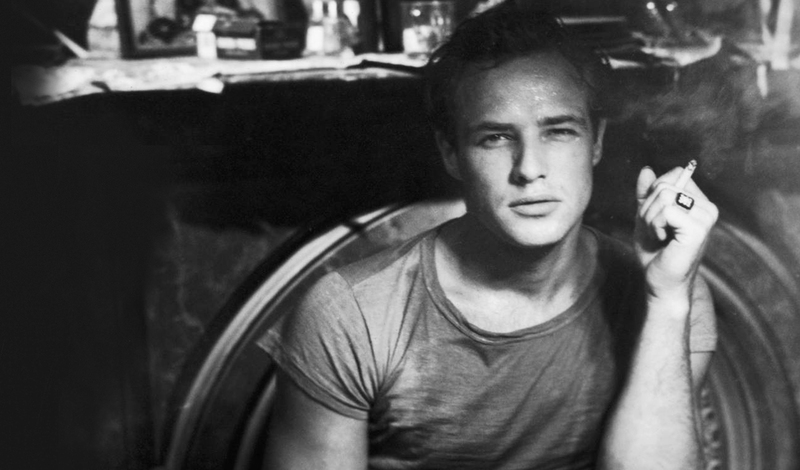 Meanwhile he had signed on to do The Misfits with Montgomery Clift and Marilyn Monroe. Clark was already in poor health as he had had at least one heart attack in the years before. But this did not stop him from drinking and smoking as much as always. He also used amphetamines to lose weight fast, which did not help his condition. Shooting The Misfits was grueling for Clark. They worked on location in the desert and his co-stars were very unstable. 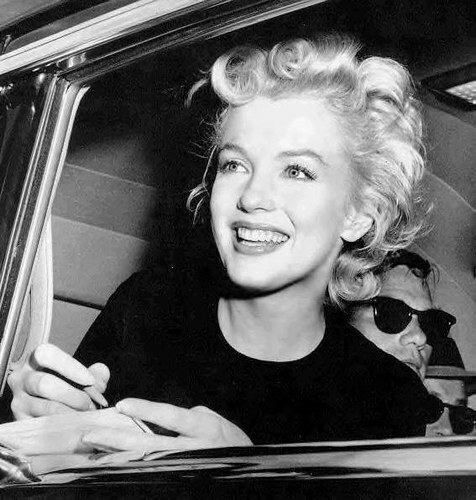 Marilyn caused most problems, since she arrived late on set most of the time and had to be hospitalized, reportedly because of an overdose. But Clark still got along well with his fragile co-stars and reportedly thought he had given the best performance of his career. A few days after filming Clark did not feel well and on November 6th 1960 he suffered a heart-attack and was rushed to the hospital. Ten days later he passed away from coronary thrombosis. He was 59. Kay gave birth to their son, John Clark, on March 20th 1961 in the same hospital. 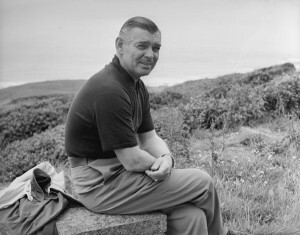 See his life in pictures in the Clark Gable Gallery. Read more about the real-life love story of Clark and Carole Lombard. 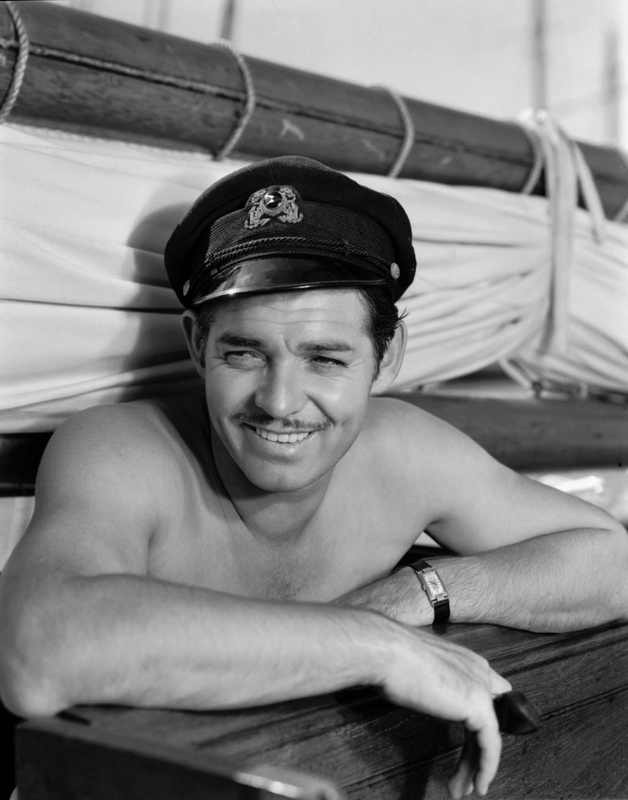 For the Clark Gable Gallery go here.